donate-ng is a Nigerian crowdfunding website dedicated to charity fund raising and campaigns for social cause. The #savekehindeadebiyi campaign started mid-November and ended mid-January; completing a 60day campaign period raising a total amount of one million, twenty four thousand four hundred and seventy naira (N1,024,407.00). 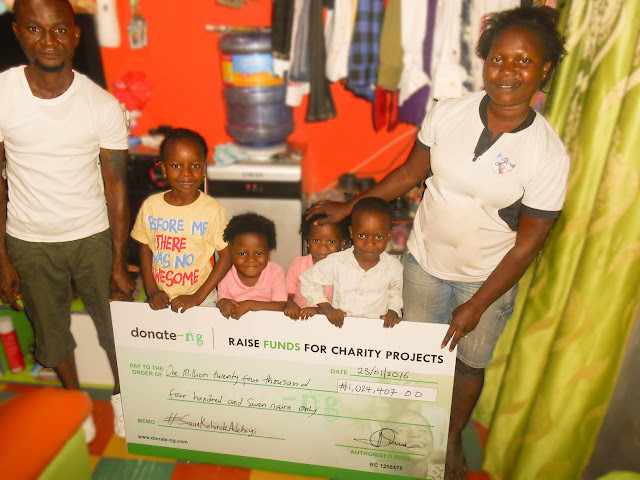 The success of this campaign could not have been possibly if not for the donations from well-meaning Nigerians who were moved by Kehinde’s story on the donate-ng crowdfunding portal – https://donate-ng.com/project/73. Just about the time donate-ng launched its services: the donate-ng team saw Kehinde’s story on Linda Ikeji’s blog and decided to run with the story. You can call it “backing up your words with your money or vis-visa”. With this achievement, donate-ng has proven crowdfunding is possible in Nigeria. Since then, many more individuals and charity organisation have contacted donate-ng to show interest in using its platform to raise funds for charitable deeds. “It’s just like I am still dreaming. How people that do not know us from Adam would be so committed to helping us this much”. The words of Mrs Adebiyi; Kehinde’s mother. She runs her small business in the quiet Lagos suburb of Cele Egbe away from the traffic madness synonymous with the “centre of excellence”. Her husband is a professional furniture maker who is very good at his job. They are an average but very OK family with 4 children, relatively unknown in the community until Kehinde developed the cancerous growth in her right ear. Their predicament made them popular and susceptible to scammers. A few people had approached them with the aim of helping, but only a very few truly meant it. donate-ng got wind of the story and contacted the family. It didn’t take too much effort to convince them to let us help. Like many Nigerians, the family doubted the intentions of NGOs. Kehinde Adebiyi is responding to treatment better than anticipated. Radiotherapy is working absolutely well. The Cancerous lump has slowly eased while the swelling has gone down considerably. The Doctors are monitoring the situation so that they can ascertain when surgery to remove the lump can be done. If need be, chemotherapy will also be done. 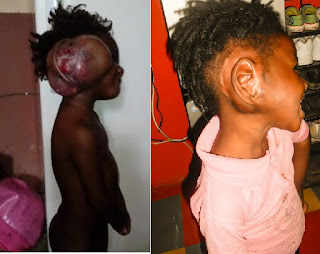 Kehinde can now play with her siblings and friends, she has even started going to school. She is a good kid who just like the kids of her age loves to run around and play. Very smart and funny; this girl is a prankster. We thank everyone who donated to this cause to put back the joy to the Adebiyi’s. This has been a great experience for us and we are glad it has finally come to fruition.